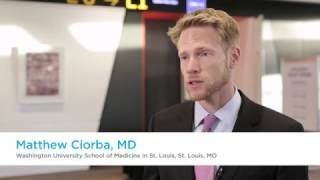 Matthew Ciorba, MD of Washington University School of Medicine in St. Louis, St. Louis, MO discusses how microbes can modify response to cancer therapy. Many patients receive both radiation and chemotherapy, or at radiosensitizing chemotherapy in case of gastrointestinal cancer. Mucositis is one of the significant side effects which can result in symptoms like diarrhea, nausea, vomiting, and anemia. 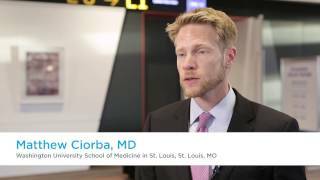 New therapies are needed to help prevent mucositis. Historical data suggest that the intestinal microbiome can modify the gut’s response to radiation injury. Dr Ciorba mentions studies focused on the use of probiotics and points out that not all probiotics are the same. Doctors need to understand which bacteria are beneficial. In addition, Dr Ciorba’s findings lead to a conclusion that probiotic treatment should be started before the cancer therapy begins. Recorded at the Multinational Association of Supportive Care in Cancer (MASCC) and International Society of Ocular Oncology (ISOO) 2016 Annual Meeting on Supportive Care in Cancer held in Adelaide, Australia.